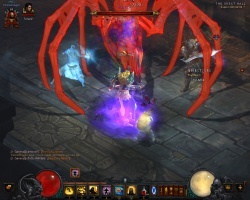 Adria the Witch' is an NPC and quest-giving character deeply involved in the story of Diablo 3. While apparently friendly and helpful in her role as Leah's long-lost mother, Adria harbors a secret agenda that leads up to the biggest plot twist of the story. Spoiler details below. 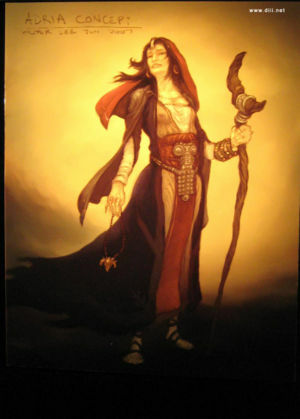 Adria was first introduced in Diablo 1, where she was an NPC merchant who sold potions, spellbooks, and various sorcerer items. She was not seen in Diablo II, but returns in Diablo III. She is not a merchant this time, but a story-teller and quest-giver who assists in the battles against the Prime Evils in Acts 2 and 3, before springing her big surprise leading up to Act 4. Adria's betrayal, the final plot event leading up to Act Four and the reborn, Prime Evil version of Diablo before "his" largely-successful assault upon the High Heavens. Adria assists in the destruction of Belial and Azmodan in Acts 2 and 3, teaching Leah to trap their souls in the Black Soulstone. The big plot twist is that Adria has spent twenty years working towards that goal in her plan to betray humanity on behalf of Diablo, the Lord of Terror. Thus at the end of Act Three, after Leah traps Azmodan's essence in the Black Soulstone, Adria sacrifices numerous guards of the keep and betrays her own daughter, magically overpowering Leah and forcing Diablo's essence into Leah's body as his host. The other Demon Lords in the Black Soulstone are incorporated as well, giving Diablo all of their powers and transforming him into the Prime Evil, a demonic force powerful enough to assault and triumph over all the forces of the High Heavens. 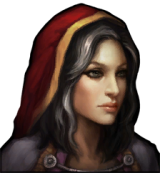 While Adria posed as a helpful NPC during events in Diablo I, she was secretly the co-leader (with Magda of an evil coven of Cultists devoted to Diablo and the service of evil. After the defeat of Diablo in that game she visited the hero (metconed in Diablo 3 from an anonymous warrior to Aidan) while he was going insane and transforming into the Dark Wanderer while trying to contain the essence of Diablo in his soulstone. Adria slept with Aidan before he truly became the Dark Wanderer and fled Tristram, conceiving a child (Leah) who was outwardly human but contained seeds of Diablo's dark presence within. After giving birth to Leah, Adria left her with Cain and abandoned Tristram as well, vanishing to spend twenty years preparing the ground for Diablo's eventual return as the Prime Evil. Thus Adria effectively bred Diablo's future host body, and Diablo effectively inhabited his own daughter when he took possession of Leah for his largely-successful assault upon the High Heavens in Act Four of Diablo III. Adria's story role in RoS is not yet fully-known, but she is known from datamining to be a major quest boss in the form of a huge Succubus. Adria's Journal (required for A Quick Study achievement). Zoltun Kulle (lore) (required for Judge of Character achievement). Adria's hut as seen in Act One. Adria in Bastion's Keep in Act Three. This page was last edited on 18 February 2014, at 16:00.